Abby Schuster of Abundance of Abby is a lake-loving blogger out of Grand Haven, MI who has enthusiastically been supporting Lake Effect Co since the start. While we met through Instagram, Abby volunteered her time earlier this year to help me at the Cottage & Lakefront Living Show in Grand Rapids, making connections with shoppers and other influencers as they shopped our booth. She's also lived in Wisconsin for a stint - so we had a ton of fun chatting about all things Badger State. She's a ray of positivity in the online space, and her helpful post below will elevate your beach days and make for an overall cleaner, easier, less painful time in the sun. Summer is right around the corner!! And that means that beach days are upon us. Living on Lake Michigan I spend a lot of my off days at the beach. (Go figure, right?) 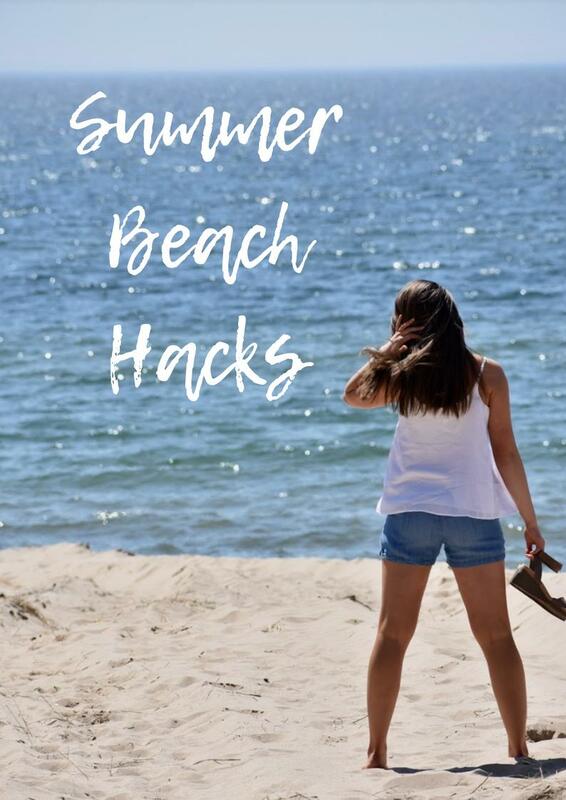 Needless to say, I've picked up on some beach day hacks that you need for the next time you head to the lake or down to the beach! Having sand stuck on my legs and in between my toes is hugepet peeve of mine. I hate walking back to the house or car and leaving a trail of sand behind me. My favorite beach hack that I learned from my mom is to always bring a tiny bottle of baby powder with you. Now I don't know the full scientific reason why, but the baby powder works really well to remove the sand! Just apply some to your legs and rub with your hand, and the sand comes right off!! It's a great hack that helps me keep my car and the house clean and definitely makes the walk back from the beach more comfortable! If you're boating or just spending the day at the beach you don't want to forget your bottle opener. It's tiny and super easy to leave at home on the kitchen counter. It's probably the worst when you're out on the water, because no one wants to go all the way back to shore to grab it. To avoid this, at the beginning of the season tie a bottle opener to your designated beach tote! This way you will always have it with you and you don't need to worry about forgetting it! Sometimes your cooler doesn't cut it for keeping everything cold. Or maybe you don't want to lug your Yeti all the way down to the water today. No matter the reason, it's a really smart idea to freeze some of your water bottles and your fruit before you go. This way, they'll stay colder longer and you don't need to worry about drinking warm water (which is seriously so gross) or fruit going bad. I saw this on Pinterest, so I can't take full credit for it, but assemble a "sand hammock" so you can lay in the sand without it getting onto your towel. Essentially all you need is a bed sheet you're okay with getting sandy, and 4 "heavier" object to put in each corner. You flip the sheet upside down, add one of the "heavier" objects to each corner and when you're done, you have a spacious sand hammock that's perfect for keeping the sand out and keeping little kids in! Keeping an extra couple of clothespins in your car or beach tote will be really handy if you need to close up any chip or snack bags that got opened at the beach! Forget about remembering to bring your chip clips with you and just keep these little guys on hand for summer adventures. A lot of people worry about their keys, wallet, and phone being stolen when they leave their towels on the beach and head for the water. Finding creative hiding spots is a great way to ensure that your valuables stay safe! Some creative ideas that I've heard of are empty sunscreen bottles, empty snack containers, and even empty baby wipe containers. No one wants to burn in the summer, so by keeping an extra tube of sunscreen (this Badger Active SPF is LEco owner Katherine's favorite) in your purse or a stick in your car, you can have spontaneous adventures and not have to worry about turning into a lobster. Just make sure to change them out once they expire - sunscreen typically has a shelf life of about 3 years. Speaking of skincare, if you do get burned here is an amazing beach hack to relieving some of the pain. Buy aloe vera (plant or gel is fine) and squeeze it into an ice cube tray and let it freeze! Then if anyone should come home pinker than they had originally hoped, they can just rub the aloe vera ice cube on the spot until it's melted. I'm lucky, because my parent's were always religious about making sure we had sunscreen, but I did get a nasty burn my freshman year at college. I really wish I would have known this trick back then! It not only alleviates pain, but it should keep from worsening and peeling, because of both the aloe vera andthe cold temperature. Enjoying a popsicle at the beach is the best. But the worst is having the popsicle melt and it getting your hands all sticky! I saw this on Pinterest a while back, and it is genius. Take a cupcake paper/liner and poke a hole in it. Then stick the popsicle through the hole and voila! You don't need to worry about it dripping onto you, because the liner should catch it. Take advantage of the beautiful summer weather and use some of these beach hacks to make your days by the water even smoother. Happy summer! !